Our deepest sympathy to foster mom Narelle Wolf, whose pup Bruiser recently crossed to the Rainbow Bridge. 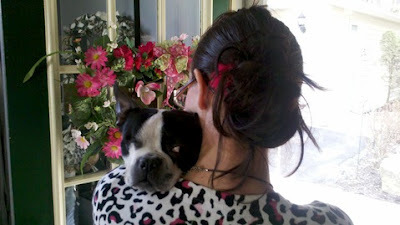 Narelle unselfishly gave Bruiser love and comfort at the end of his journey. He knew compassion in his last days with Narelle, and Narelle loved him deeply, although their time together was too short. "I just received the most beautiful card from you and your directors. I can't tell you how wonderful it felt to have this little guy remembered by you all. 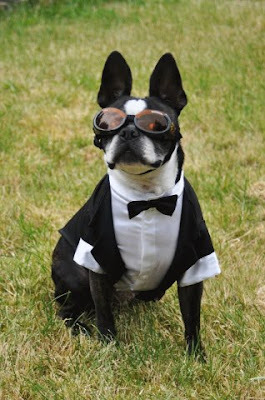 I told Bruiser when he left that he was not a foster but my dog. He really entered my heart in a big way. and classy group of people i have ever had the honour to work with. Bruiser and I thank you and love all of you." Muno is loving life with the Hess family. He recently had a scratch on the cornea of his remaining eye, but after treatment by a doggie opthamologist, it is now healing nicely. 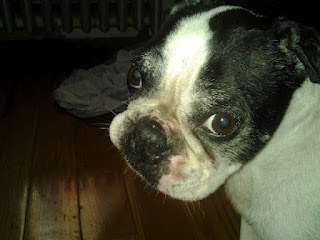 "I just got back from the opthamologist and Muno was much better than what she was expecting. She said our vet was right on target with the treatment. The scratch is deep about half way through the cornea. She can see that it's trying to heal itself so we're going to continue with the ofloxacin every three hours and the serum every two. We're going back first thing tomorrow so she can take another look. If it continues to heal we will avoid surgery... so keep your paws crossed!! She did see a cataract as well and we will address that after his scratch has healed." We all wish the best for Muno for a very speedy recovery! 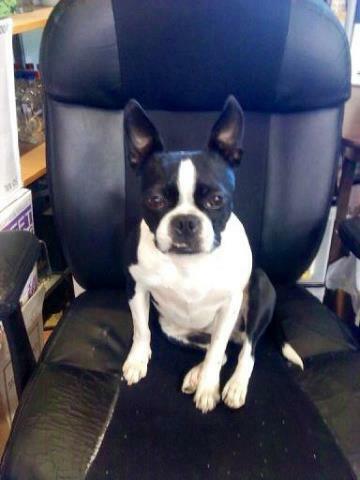 "This is Gizmo a 6 year old boy who is just super. Gizmo is ready for his forever home. Would do great as a city dweller or anywhere...as long he is with his people. Will sleep all day or hike all day whatever you want to do!" 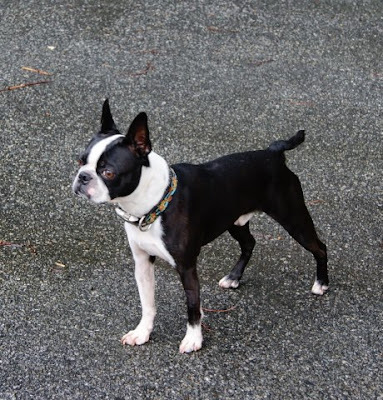 Longtime NEBTR supporter and angel Janis Doland passed away in February, and gave her extensive collection of Boston Terrier collectibles to NEBTR. This very extensive BT collection will be auctioned to aid our Bostons. There are too many items to count, but probably 50+ pieces of art (prints, originals, etc) 300 or more stautuary including several Hubley door stops, 2 pieces of Baldwin bronze sculptures, and several items that are pictured in the Boston Terrier Collectibles book. Lamps, pillows, you name it. This collection is scheduled to be held on September 1. Thumbnail pics will be available on their website on Aug 30. People can call in their bids with a mention of the item number. The actual auction is Sept. 1. Watch for more information on this! Congratulations to Heather Coursen and her foster Georgie! Georgie has been adopted! Special thanks to Heather for all the loving care she gave to this boy. "Georgie was adopted by Leslie and Chuck Archer. They adopted Tucker in the past from NEBTR and thought it was a good time to get another dog. Tucker and Georgie are attempting to settle in together - you know how it goes with adding a new dog to the house! 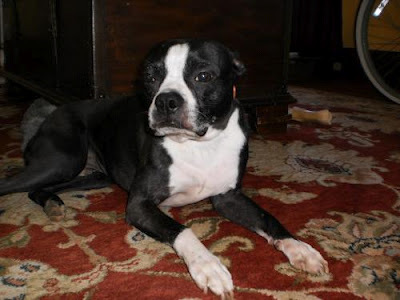 Georgie is a very anxious dog who is upset easily by changes, such as moving to a new home. The Archers have been working with him and are so wonderful and devoted, trying to make Georgie as comfortable as possible in his transition from foster care to new home. They love him completely and Georgie is enjoying having someone to snuggle on the couch. And in time we're all sure Tucker will come around to him, too!" having fun for the first time in a very long time. my way. Stay tuned in for more adventures." 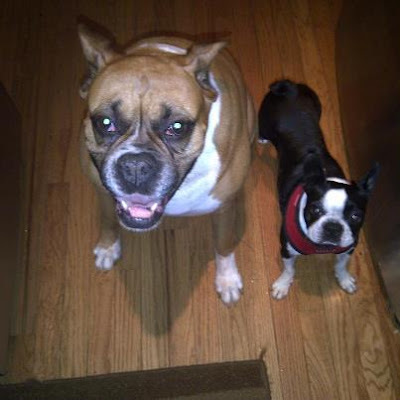 Check out my pic with me and my foster sibling! And special thanks to foster mom Janet Hassell for loving and taking such good care of this little girl! 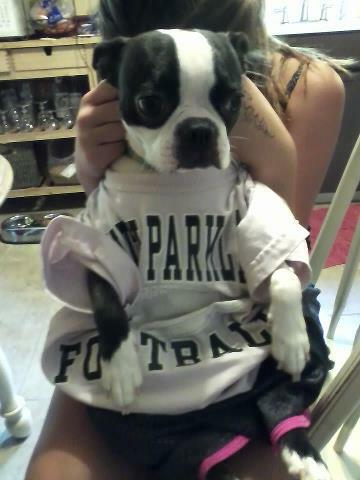 Dezi is getting ready for her human brother's season, YUM, all those pigskins just waiting to be devoured. Says Dezi "I'm a really good runner, too, so fast they can't catch me. No need to worry about tackles, I just run between their legs. By the way, are there penalties for nipping an ankle or jumping on top of the pile? A big welcome to Dash! He's a small, 17 lbs, sweetheart, just a youngster at four years old. Didn't get along too well with the kids in his former home so now he's relaxing in his foster home while becoming a bit more socialized. He is being lovingly fostered by Heather Coursen. Dash will be available soon for adoption so keep your eyes open for his posting if you would like to add lots of love to your home. Hi It's me Hope!! 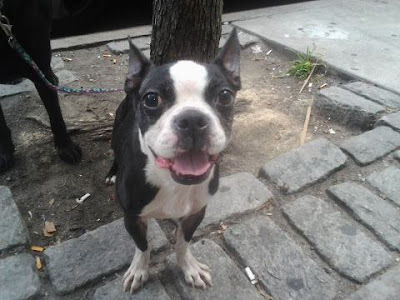 Remember how skinny I was when NEBTR pulled me out of the NYC shelter a few weeks ago? My foster Mom is taking such good care of me! I'm so happy to be out of there! Lexi when she was rescued by NEBTR. Meredith Festa and Lexi show us why we do what we do. "It's Lexi! Can u believe it!!!!???? She is 19 pounds now. She was 8 when we got her in to foster... All beat up and skinny. Look at her now! So cool. She is a perfect little lady too..."
And thank you, Meredith, for helping this little girl. 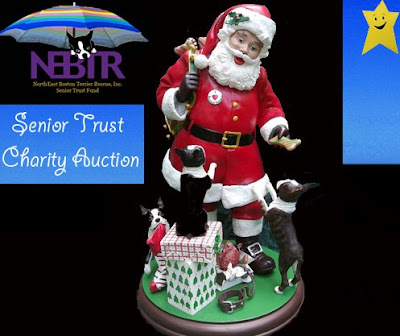 Senior Trust Charity Auction is a stand alone auction of a quality item in exchange for a donation to the NEBTR senior trust fund. The auction starts at one dollar and must increment by at least a dollar no change considered. Action ends 8/25/12 SATURDAY NIGHT 10PM EST. The auction is right here just place your bids for the item in the comments. OK here we go one each week to finsh off summer for seniors offering a super cute Danbury Mint Cozy Boston Terriers Christmas Eve figurine in excellent condition. A heartwarming, hand-painted, lighted sculpture of a lovable Boston Terrier family celebrating the holidays. Powered by AC cord with on/off switch. The fireplace and red and green bulbs light up beautifully. If you were thinking about making a donation why not bid you will help seniors live out there years in dignity and get something very nice for yourself at the same time.